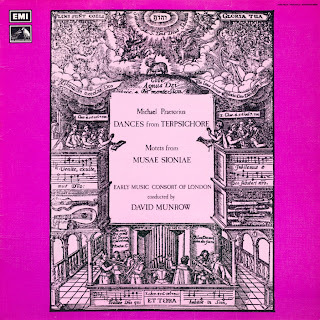 To listen to the 1970s recordings of David Munrow and his Early Music Consort of London is to realize how pivotal they were in transforming early music from an academic specialty into a living performance tradition. The performances are based on thorough academic research, but they are varied, vital, and enthusiastic, meant for concert audiences rather than academic meetings. And the Early Music Consort of London roster is packed with future stars. 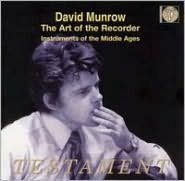 This two-CD set offers the complete contents of what was originally a double Munrow LP, The Art of the Recorder, plus the first half the Middle Ages half of another double LP, Instruments of the Middle Ages and Renaissance. The Renaissance half is available as part of a different CD reissue, Music from the Court of Ferdinand and Isabella. Splitting up the Instruments album is a strange choice. Intended to accompany a book about the history of musical instruments, it contained dozens of tiny little pieces, each illustrating a different instrument bagpipes, bladder pipes, and cow horns are all included, and the variety of instruments could point even well-informed modern players in new directions. It wasn't particularly well recorded, and its value would seem to be most apparent to someone who wanted the whole thing. The decision was made probably because the two LPs of The Art of the Recorder spill slightly over the confines of a single CD. Something was needed to fill out the second disc, but other choices were available. This objection aside, The Art of the Recorder remains a delight. As a survey of the literature for the instrument it is still valid, even with all the new repertories that have emerged since the album was recorded in 1975. Munrow includes two medieval dances, a nice selection of Renaissance music including arrangements of vocal pieces, purely instrumental conceptions, and a set of "Five Dances" of Antony Holborne. The Baroque section includes a Schmelzer sonata, concertos by Vivaldi and John Baston, two lovely and little-known musettes by François Couperin, and a group of vocal pieces by Bach and others containing famous recorder parts. As was common in the early years of the historical-performance movement, Munrow also includes several pieces from the twentieth century. A Paul Hindemith trio from the "Plöner Musiktag" is a fascinating and instrumentally idiomatic document from the dawn of the German rediscovery of the recorder. All the performances are enjoyable, and in such works as the medieval "Saltarello," Track 2, Munrow gives the lie to the idea that early music players of the era did not value instrumental virtuosity. In any event, it's a sign of health that the field of authentic-performance recordings now has its authentic reissuable classics, and here's hoping that Testament succeeds with this release and follows it up with many more. The remastering of the original Abbey Road studios sound is clean and unobtrusive.